Publication History: This article is based on Chapter 7 of "The Log Analysis Handbook" by E. R. Crain, P.Eng., published by Pennwell Books 1986 Updated 2004. This webpage version is the copyrighted intellectual property of the author. Don't fail to use this routine. It makes computer output look pretty nice even with poor logs. This material balance prevents the sum of shale volume, porosity and rock matrix from exceeding 100%. PHIMAX is also useful for estimating porosity in shaly sands where only an SP or gamma ray log is available, since it provides a porosity value based only upon the shale content and the analyst's assumed maximum possible porosity. With offset well data or core data for control, this is not a bad approach for wells with a very limited log suite. It is often used in computer analysis of ancient logs. Because of its gross assumptions, a warning note should be annotated on the results, if the method is used. This method has been very successful where good control of Vsh and PHIMAX are possible, based on core data and density neutron porosity in offset wells. Choose from core and density neutron data in offset wells. Plot VSH vs PHIe to extrapolate to zero Vsh. 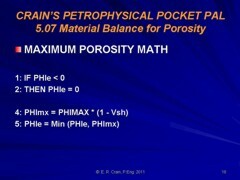 Using the PHIMAX equation with a PHIMAX of 0.30:PHIe = (1 - 0.65) * 0.30 = 0.105 which indicates the sand fraction has a porosity of 0.30 by edict of the analyst. This is more reasonable than the value of 0.85 derived earlier.